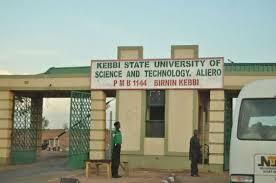 Kebbi State University of Science and Technology (KSUSTA) Registration Guidelines and Procedures for Fresh and Returning Undergraduate Students for the 2018/2019 Academic Session. This is to inform all the returning students of the Kebbi State University of Science and Technology (KSUSTA), that the management of the institution has released the registration procedure for the 2018/2019 academic session. STUDENTS WHO FAIL TO COMPLY WITH THE ABOVE DIRECTIVES WILL BE CHARGED FOR LATE REGISTRATION A WEEK AFTER RESUMPTION OF THE ASUU STRIKE. After making payment, return to the University portal and login with your details to do online Registration. Click on Bio-Data and a drop down menu will appear prompting you to enter your RRR Code for verification and also to have access to your Bio-Data and Course Registration Forms (CRF). Once it is down, you will fill-in all relevant entries in the Bio-Data Form and click on SAVE. Click on Courses Registration to open the form and Add/Delete Courses according to your Departmental Registration Guidelines. Then click on Save the CRF and Print out the Registration forms as your next step and submit to the concerned Units/Offices for signing were necessary. NOTE: Make sure you always click on LOG OUT from your profile page whenever you login. After signing with all the relevant Units, you are expected to photocopy all your credentials including JAMB online Admission Letter, Confirmation of Admission, UTME/DE Result slip, Admission Status, RRR Payment Slip and all the forms mention above and insert one copy each into all the three (3) files and proceed to Academic Division for submission of the three (3) files. At the point of submitting files at the Academic Division, you will be issued with MIS FILE and you are expected to insert photocopies of the following into the file and submit back instantly. They are; JAMB online Admission Letter, Confirmation of Admission, UTME/DE Result slip, Admission Status, Student Bio-Data Form and Course Registration Form. You are expected to proceed to the University Main Library and submit photocopies of the following documents to the Officer In-charge of Registration. They are; Confirmation of Admission, Student Bio-Data Form and RRR Payment Slip. Students are expected to keep one copy each of all the Registration Documents submitted as their personal copy for future reference. This is a step–by–step procedure to guide all Returning Students for the Completion of their Registration after making payment of school fees. After making payment, return to the University portal and login with your details to do online Registration. Click on Bio-Data and a page will appear prompting you to enter your RRR Code for verification and also to have access to your Bio-Data andCourse Registration Forms (CRF). 2. Course Registration Form(6 copies) – To be signed by the Departmental Level Coordinator and leave a copy with him. After signing with all the relevant Units, you are expected to submit all the forms mention above to your Faculty Officer.